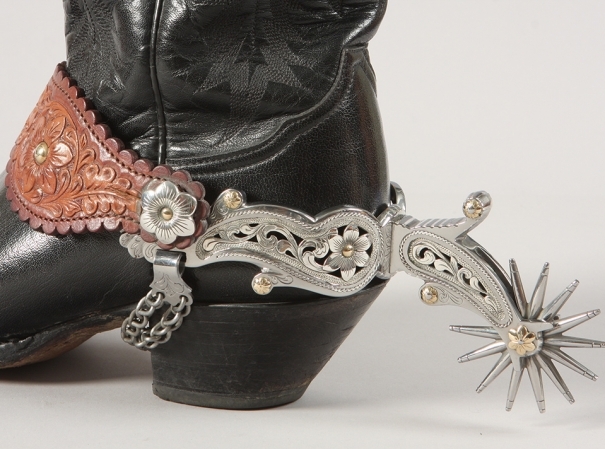 In a display of highly decorated saddles, bridles, quirts, and spurs, this exhibition demonstrates how everyday items of cowboy culture become an impetus for complex design, ornamentation, and collaboration between artists. With this selection of embellished equestrian objects borrowed from a regional private collection, makers from Mexico to Oregon bridge the divide between art and function, showcasing the creativity of contemporary cowboy culture in North America. Monte Beckman (saddlemaker), Ernie Marsh (silversmith), Saddle, 2005. Leather, wood, rawhide, silver, gold, steel, 36 × 27 × 29 inches. Collection of J. Brent and Connie McKinley, Washington State.